Eating well in pregnancy (and even before) is very important as it provides the nutrients and energy that the growing baby needs. It’s not just eating for two, though, it’s choosing the right foods as well, and eating a well-balanced and varied diet. The chances of conceiving are much better when women are in their healthy weight range. Being overweight (body mass index [BMI] of over 25) can affect ovulation (egg production), because it increases women’s hormone levels, as these hormones are made from fats. It can also increase the risk of complications like pre-eclampsia and diabetes during pregnancy. Being overweight can reduce sperm production in men. Being underweight (BMI of under 18) can reduce hormone levels, stopping periods and ovulation, and there is a possibility of having a low-weight or premature baby. Have a varied diet, including protein, such as beans, peas and lentils (pulses) and lean meat and fish, including two portions of oily fish a week; carbohydrates, such as brown rice, pasta and potatoes; and plenty of fruit and vegetables. Good levels of calcium (from dairy foods, leafy green vegetables, and nuts and seeds) and iron (from leafy green vegetables, red meat, pulses, dried fruit, bread and fortified breakfast cereals) are also important. Folic acid is vital from before conception until the 12th week of pregnancy), as it protects against damage to the baby’s spinal cord (known as ‘neural tube defects’) like spina bifida – either take a supplement containing 400 mcg of folic acid, or eat plenty of leafy green vegetables and brown rice. Don’t have too much vitamin A, which can affect the developing baby – so avoid liver, or things made with liver, such as pâté, and don’t take vitamin supplements containing vitamin A or fish liver oils. Don’t eat shark, swordfish and marlin, and don’t eat too much tuna, as these can contain levels of mercury that are fine for adults but harmful for a developing baby’s nervous system. 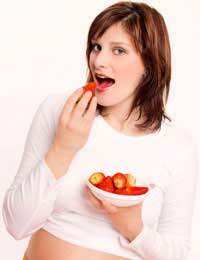 Follow the same advice as eating when trying to get pregnant – there are a few extra suggestions as well. Get plenty of vitamin D, either from careful exposure to the sun (don’t burn) or from a supplement – but fresh air and gentle exercise outside is important during pregnancy anyway. certain kinds of fish (as discussed above). Finally, avoid alcohol or limit it to one or two units, once or twice a week, and cut down on caffeine, as too high levels may be linked to babies with low birth weights. Above all, enjoy the food and enjoy the pregnancy!